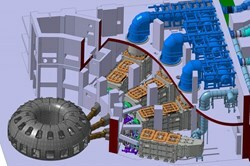 The ITER Tokamak will rely on three sources of external heating to bring the plasma to the temperature necessary for fusion: neutral beam injection (right) and two sources of high-frequency electromagnetic waves—ion and electron cyclotron heating (left, blue and green launchers). 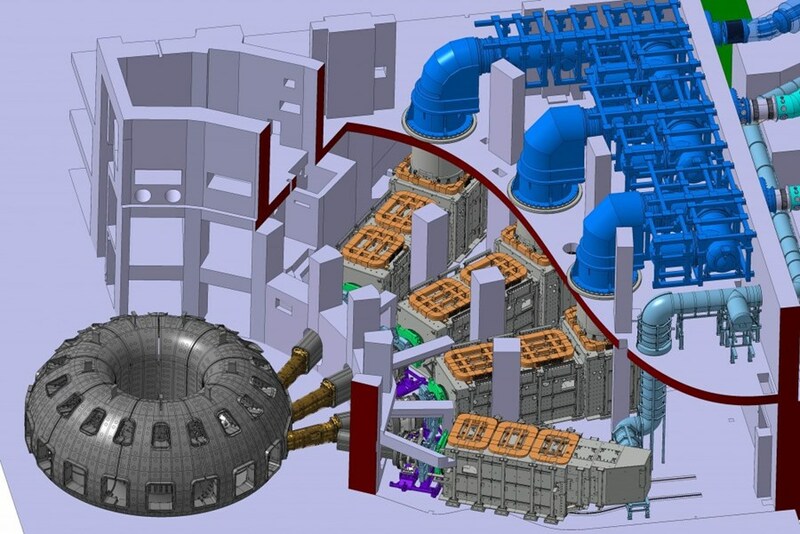 The temperatures inside the ITER Tokamak must reach 150 million° Celsius—or ten times the temperature at the core of the Sun—in order for the gas in the vacuum chamber to reach the plasma state and for the fusion reaction to occur. The hot plasma must then be sustained at these extreme temperatures in a controlled way in order to extract energy. The ITER Tokamak will rely on three sources of external heating that work in concert to provide the input heating power of 50 MW required to bring the plasma to the temperature necessary for fusion. These are neutral beam injection and two sources of high-frequency electromagnetic waves. Ultimately, researchers hope to achieve a "burning plasma"—one in which the energy of the helium nuclei produced by the fusion reaction is enough to maintain the temperature of the plasma. The external heating can then be strongly reduced or switched off altogether. A burning plasma in which at least 50 percent of the energy needed to drive the fusion reaction is generated internally is an essential step to reaching the goal of fusion power generation. One of the powerful neutral beam systems that will heat up the plasma (the ITER plasma chamber is at left). Using injection to heat the fuel in the ITER Tokamak is very much like using steam in the household cappuccino machine to heat milk. Neutral beam injectors are used to shoot uncharged high-energy particles into the plasma where, by way of collision, they transfer their energy to the plasma particles. Before injection, deuterium atoms must be accelerated outside of the tokamak to a kinetic energy of 1 Mega electron Volt (MeV). Only atoms with a positive or a negative charge can be accelerated by electric field; for this, electrons must be removed from neutral atoms to create a positively-charged ion. The process must then be reversed before injection into the fusion plasma; otherwise the electrically-charged ion would be deflected by the magnetic field of the plasma cage. In neutral beam injection systems, the ions pass through a cell containing gas where they recover their missing electron and can be injected as fast neutrals into the plasma. There is space for three neutral beam injectors on ITER (two will be installed first, with space for a third if the operational program requires it). At right, a smaller bay will receive the diagnostic neutral beam. The large plasma volume at ITER will impose new requirements on this proven method of injection: the particles will have to move three to four times faster than in previous systems in order to penetrate far enough into the plasma, and at these higher rates the positively-charged ions become difficult to neutralize. At ITER, for the first time, a negatively-charged ion source has been selected to circumvent this problem. Although the negative ions will be easier to neutralize, they will also be more challenging to create and to handle than positive ions. The additional electron that gives the ion its negative charge is only loosely bound, and consequently readily lost. Two neutral beam injectors—each one delivering a deuterium beam of 16.5 MW with particle energies of 1 MeV—are currently foreseen for ITER. A third neutral beam will be used for diagnostic purposes. A test program is underway now at the Neutral Beam Test Facility in Padua, Italy to investigate challenging physics and technology issues in advance of the installation of the neutral beam equipment at ITER. More on the Neutral Beam Test Facility here. Two 45-ton ion cyclotron resonant heating antennas will deliver 10 MW of heating power each into the ITER machine. Ion and electron cyclotron heating methods use radio waves at different frequencies to bring additional heat to the plasma, much in the same way that a microwave oven transfers heat to food through microwaves. 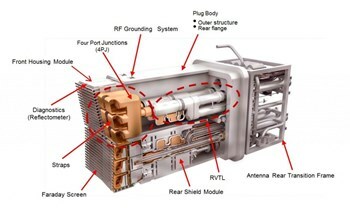 In ion cyclotron resonance heating (ICRH), energy is transferred to the ions in the plasma by a high-intensity beam of electromagnetic radiation with a frequency of 40 to 55 MHz. A generator, transmission lines and an antenna are necessary for ion cyclotron heating. A generator produces high-power radio frequency waves that are carried along a transmission line to an antenna located in the vacuum vessel, sending the waves into the plasma. Electron Cyclotron Resonance Heating (ECRH) heats the electrons in the plasma with a high-intensity beam of electromagnetic radiation at a frequency of 170 GHz, the resonant frequency of electrons. The electrons in turn transfer the absorbed energy to the ions by collision. The electron cyclotron heating system is also used to deposit heat in very specific places in the plasma, as a mechanism to minimize the build-up of certain instabilities that lead to cooling of the plasma. In comparison to the ICRH system, the ECRH has the advantage that the beam can be transmitted through air which simplifies the design and allows the source to be far from the plasma, simplifying maintenance. Power will be provided by powerful, high-frequency gyrotrons as power sources. 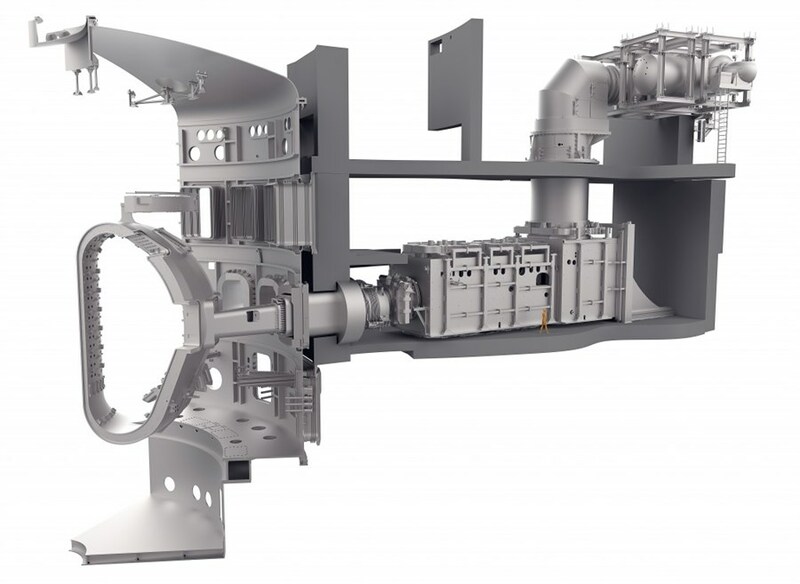 The ITER design includes the development of a 1 MW gyrotron operating at 170 GHz with a pulse duration of more than 500 s.
Each of ITER's 24 gyrotrons will generate a microwave beam over a thousand times more powerful than a traditional microwave oven. 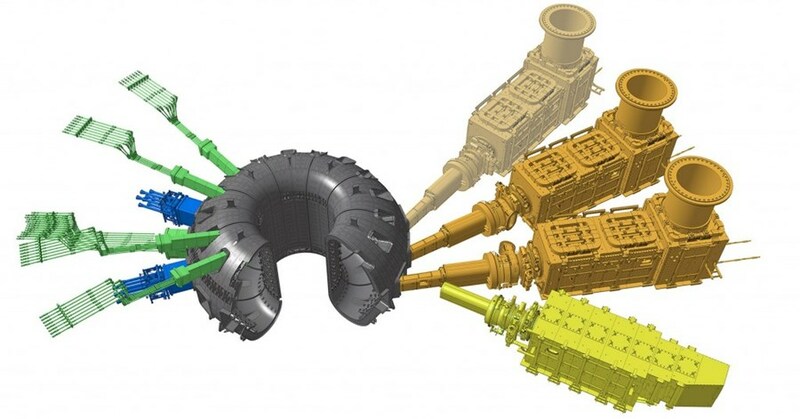 Gyrotrons for ITER's electron cyclotron system are under development in Europe, India, Japan and Russia.